Within the first minute of watching, all of my doubts were put to rest. JourneyQuest had me laughing myself silly, and I found myself immediately watching the rest of the series. This is a great example of what can be done with a web series if the people behind it are willing to put the effort in. The show has great production values, great actors and a well-written story. The last point is one that is often missed in web series (and everywhere else for that matter). Creators often fail to realise that all the production value in the world won’t save a web series if the story behind it isn’t working. The recent Mortal Kombat: Legacy is a good example of something that looks like it was made by Hollywood, but is lacking substance. While JourneyQuest’s production values aren’t as high, the world they have created is very believable and this combined with the other elements makes for a far superior show. 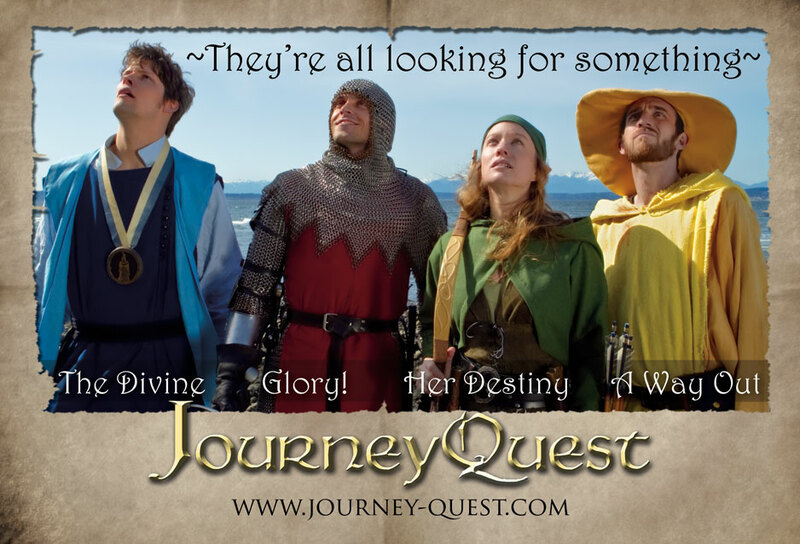 JourneyQuest stands up alongside famous shows as The Guild for creating a simple but compelling story full of interesting characters. We have the wizard Perf, who is skilled at many things (magic not being one of them), the elven Ranger Nara who is searching for her destiny, affable priest Carrow who often finds his patience sorely tested, and the warrior Glorion who feels that killing equals honour. The group is closely followed by the young bard Wren who is looking to write her first epic. Along the way they come across orcs, nyads, assassins and many other hazards that are necessary for a D&D tale. While the characters at first seem fairly simple, the show does a great job of filling in their personalities and back story as their quest continues. Each of the actors is perfectly suited to their role, and they have no problem embracing the often-silly elements of the story. The story also takes an interesting non-linear approach to ease the audience into the story without getting bogged down in exposition. Overall, JourneyQuest is a fantastic show that wouldn’t feel out-of-place on television. The guys at Zombie Orpheus Entertainment have a mantra of No Studio, No Network, No Cancellation, relying on the support of their fans to keep going. I’ve linked the first episode below; If you like it, make sure to head over to their website to see how you can contribute to a second season. What I Liked – Great use of the setting. Interesting characters. Great humour. What I Didn’t Like – The humour missed in a couple of spots. I have to wait for season 2.
is the HIPPEST, COOLEST, LOVABLE, UNIQUE, SUPER NERD of the 21ST CENTURY! Bartholomew Fogglehorn is a 22year old actor who moved from the midwest and has been living in Hollywood, California for the past year. After landing a role on his first audition he began the rounds of casting looking for his next break when Murphy’s law hit and anything that can go wrong goes wrong after waking up on the wrong side of the bed. getting his next gig and getting his manager to represent his model girlfriend. cause he hasn’t gotten his talent manager to represent her yet. He finds that love isn’t always what you think.